You will find below the horoscope of Jeanette Biedermann with her interactive chart, an excerpt of her astrological portrait and her planetary dominants. Horoscopes having the same aspect Moon trine Saturn (orb 0°49'): Eminem, José Bové, Jake Gyllenhaal, François Fillon, Gerard Butler, Jacqueline Kennedy Onassis, Matt Damon, Nostradamus, Kris Jenner, Stephen Hawking, Stephen King, Jimmy Fallon... Find all the celebrities having this aspect. Celebrities clicked on in real-time: 576,045,077 times. Jeanette Biedermann (born February 22, 1980 (birth time source: http://de.wikipedia.org/wiki/Jeanette_Biedermann http://www.musuma.de/Artists/J/Jeanette/index.html and http://www.myspace.com/jeanettesupport)), also known by her stage name Jeanette, is a German recording artist, actress and television personality. Born and raised in Berlin, Biedermann began performing as a member of a troupe of acrobats in a children's circus at the age of six. She later attended beauty school before dropping out to pursue her music career following her participation and win of the Bild-Schlagerwettbewerb competition in 1999. Biedermann came to prominence within the music industry following the release of her debut studio album Enjoy! (2000) which spawned the top ten hit single "Go Back. Here are some character traits from Jeanette Biedermann's birth chart. This description is far from being comprehensive but it can shed light on his/her personality, which is still interesting for professional astrologers or astrology lovers. 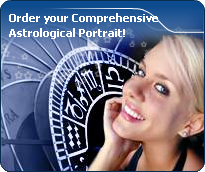 In a matter of minutes, you can get at your email address your astrological portrait (approximately 32 pages), a much more comprehensive report than this portrait of Jeanette Biedermann. Jeanette Biedermann, the diurnal South-eastern quadrant, consisting of the 10th, 11th and 12th houses, prevails in your chart: assertion and goals achievement are at the centre of your concerns. You are very keen to implement your dreams and your plans. You achieve your ambitions as soon as possible, whether through an active social life, highly charged friendly relations, or an urge to take actions in order to reap - in the eyes of the world, of course - the rewards of your dynamism. It is likely that spirituality or humanitarian actions are part of your motivations, sometimes at the price of some degree of isolation. The predominance of Water signs indicates high sensitivity and elevation through feelings, Jeanette Biedermann. Your heart and your emotions are your driving forces, and you can't do anything on Earth if you don't feel a strong affective charge (as a matter of fact, the word "feeling" is essential in your psychology). You need to love in order to understand, and to feel in order to take action, to the detriment of a certain vulnerability against which you should learn to fight. Like the majority of Earth signs, Jeanette Biedermann, you are efficient, concrete and not too emotional. What matters to you is what you see: you judge the tree by its fruits. Your ideas keep changing, words disappear, but actions and their consequences are visible and remain. Express your sensitivity, even if it means revealing your vulnerability. Emotions, energy and communication must not be neglected; concrete action is meaningless if it is not justified by your heart, your intellect or your enthusiasm. Air is under-represented in your natal chart, with only 9.57% instead of the average 25%. Air symbolizes the values of communication, exchanges with others, but also adaptability and flexibility abilities: if you don't get out of your cocoon to talk, to show interest in others, and to socialize, you may have problems understanding others. Because of your lack of flexibility or of your refusal to adapt yourself, you may be suddenly overwhelmed by events. You should get into the habit of talking, of phoning, and of thinking in terms of "mobility, flexibility, adaptability, change" in every circumstance. It will spare you so many troubles! The Mutable mode is the most emphasized one in your natal chart, Jeanette Biedermann, which indicates a mobile character that is curious and thirsty for new experiences and evolution. You are lively and flexible, and you like to react quickly to solicitations, but don't confuse mobility with agitation, since this is the danger with this configuration - and with you, stagnation is out of the question. Security doesn't matter as long as you are not bored. You optimize, you change things, you change yourself... all this in a speedy way. Your angular houses, namely, the 1st, 4th, 7th and 10th houses, are very emphasized in your chart, Jeanette Biedermann: according to the Tradition, they are the strongest and most dynamic houses. Should the rest of your chart concur, angular houses suggest that you are an enterprising, energetic and assertive woman. Indeed, angular houses are said to generate impulsions and to give a powerful and domineering personality. The 4th, 10th and 12th houses are the most prominent ones in your birth chart. From the analysis of the most tenanted houses, the astrologer identifies your most significant fields or spheres of activity. They deal with what you are experiencing - or what you will be brought to experience one day - or they deal with your inner motivations. After this paragraph about dominant planets, of Jeanette Biedermann, here are the character traits that you must read more carefully than the previous texts since they are very specific: the texts about dominant planets only give background information about the personality and remain quite general: they emphasize or, on the contrary, mitigate different particularities or facets of a personality. A human being is a complex whole and only bodies of texts can attempt to successfully figure out all the finer points. Love at first sight, flash in the pan, amorous impulsiveness? All these are part of your way of loving or to fall in love, Jeanette Biedermann. Throughout your relationship, you maintain this kind of jerky and lively style, that may seem childish or naïve, but that is so generous and cheerful! You are undeniably possessive and you are not concerned with your partner's opinion but, fortunately, you readily forgive because of your spontaneity and your authenticity. When your relationship is intense, everything is fine. There is no romanticism, no complications with you. You love with ardour and, except for a few crazes and opportunities for new pastures here and there, the only danger may be that boredom settles in. In that case, you leave without regret and you quickly forget what consumed you, not so long ago. The ruler of the Ascendant, Jeanette Biedermann, is the Moon. In Taurus, it endows you with prudence and patience. You work with perseverance, and you are committed to finishing off what you have undertaken, because you are not the kind of person who would throw up the towel easily. You are happy to reap the fruits of your labour, and why not, to make your business thrive. Jeanette Biedermann, you skilfully make use of your energy and you are like the arrow that reaches its target with great precision: with piercing eye and sharp mind, you take action meticulously and efficiently. Like the surgeon with his scalpel, you know exactly what you want and you belong to the category of specialists, not the generalists. Critical, pernickety, extremely organized, you want to foresee and to analyze. You prefer to master your business too well rather than not enough, even if you must put a huge, sustained, long lasting effort into it. Sexually, you remain fanatical about cleanliness. You may be prone to fantasies such as fetishism. Your love life is fine if you avoid the unforeseen events that you loathe. This text is only an excerpt from of Jeanette Biedermann's portrait. We hope that it will arouse your curiosity, and that it will prompt you to deepen your knowledge of astrology, as well as to visit and use the wide range of free applications at www.astrotheme.com.